The discussion should cover the whole of the work and all of its phases. In the discussion, the results are fused together with the background information given in the introduction and theoretical basis sections of the report, and the main outcomes disclosed. Hence, to some extent aspects similar to those in the main body of the report are treated again. However, the discussion presents a deeper analysis enriched by the knowledge gained during the process of compiling the bachelor’s or master’s thesis. The author’s own outcomes can be compared with those previously reported by others, and a critical analysis made of the similarities and differences. 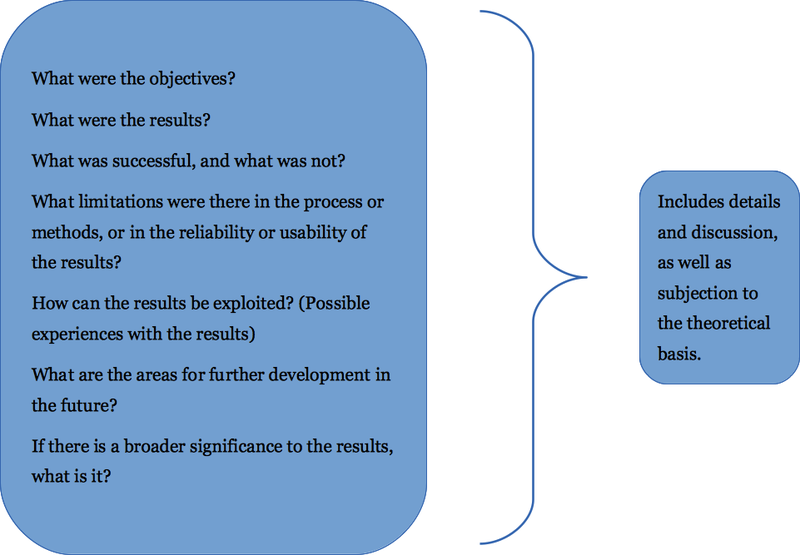 These outcomes-based conclusions indicate how the bachelor’s or master’s thesis has changed or increased the knowledge base of the field of study or development, and what the practical implications of the outcomes are. The assumptions and limitations concerning the conclusions are presented—for example, in a small sample—as well as any hypotheses that proved to be invalid. The discussion is important, as it calls for the author’s personal touch and the expression of his/her own opinions and views. Good prose style still needs to be maintained, and any arguments or generalisations justified. The discussion divulges the author’s scholarly maturity—or lack thereof. Therefore, it is advisable to keep notes of thoughts and reflections on the research topic throughout the entire process of working on the thesis, and to write the discussion section of the report in due time.